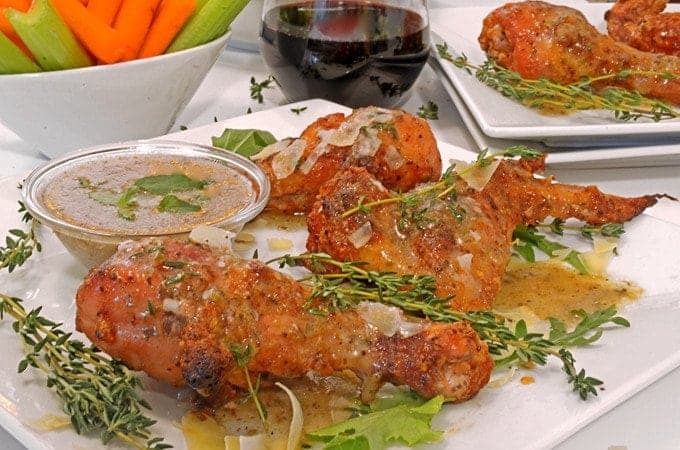 This recipe for crispy baked chicken wing has just three ingredients! You may have noticed, they’re the only things I’ve made in a long time. In our absence, we featured the culinary art of a few of the best food bloggers on the globe, while we traveled it. These 3 Ingredient Crispy Baked Italian Chicken Wings seem like the ideal post to feature upon our return. I just know that you’re going to love them. 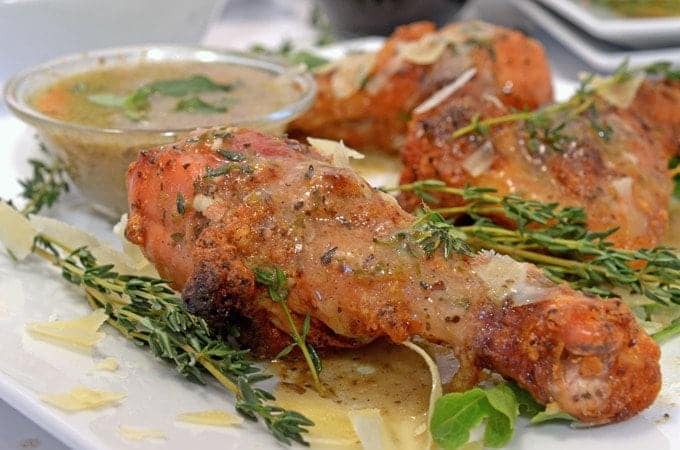 Garnish these baked chicken wings with your favorite dressing or sauce. 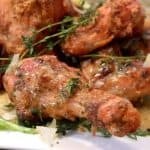 You may have noticed that I chose to use some medium-size chicken wings for this easy baked chicken wings recipe. Call me big-boned if you will, I was planning on making these for the kids and us, and I wanted something a bit more substantial than the smaller chicken wings that most of us associate with traditional chicken wings. Let me assure you, either size works! These healthier chicken wings are in the oven for about an hour, depending on their size. They’re baked, not fried. Less fat and no grease! Just THREE (3) ingredients, including the chicken. Our family prefers these baked chicken wings over fried chicken wings as does my cholesterol level! Scott made a great point by observing that these baked chicken wings don’t require a sauce to dip them in. I have to agree. Nonetheless, we used a bottle of our favorite salad dressing. The combination was sublime. 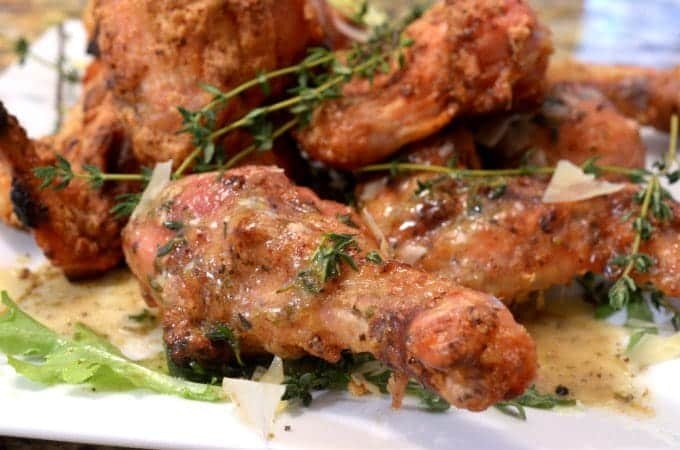 I love to dip these baked crispy chicken wings into some Italian salad dressing. 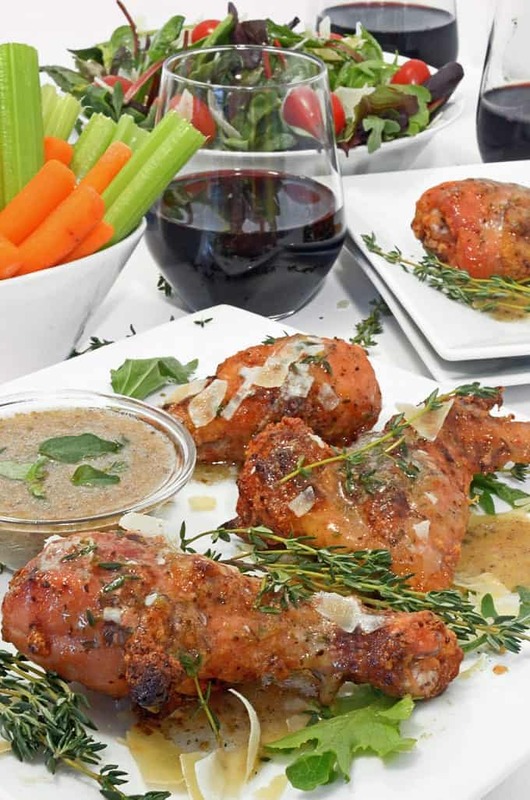 Sauce or no sauce, please give this easy baked chicken wings recipe a try. 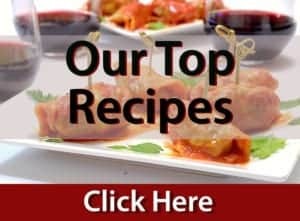 You won’t believe how wonderful they taste, how easy they are to make, and how affordable they are to enjoy. 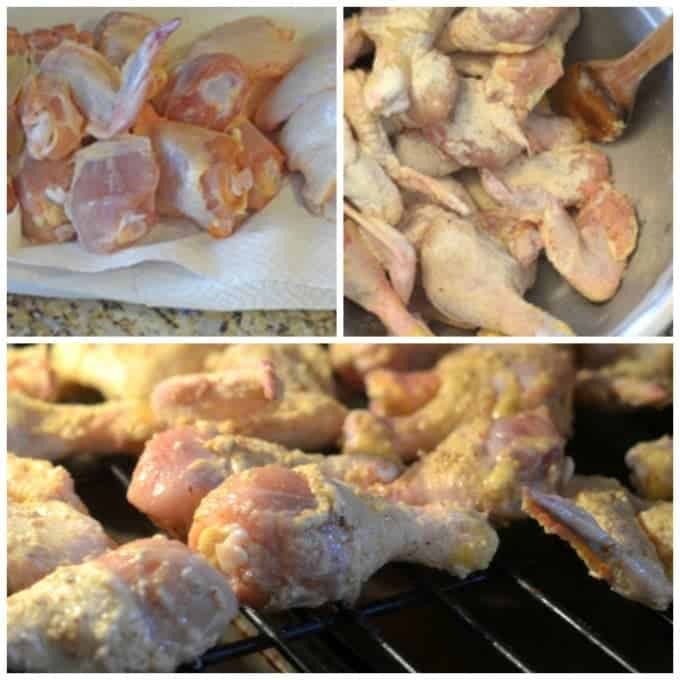 Try this easy baked chicken wings recipe soon! 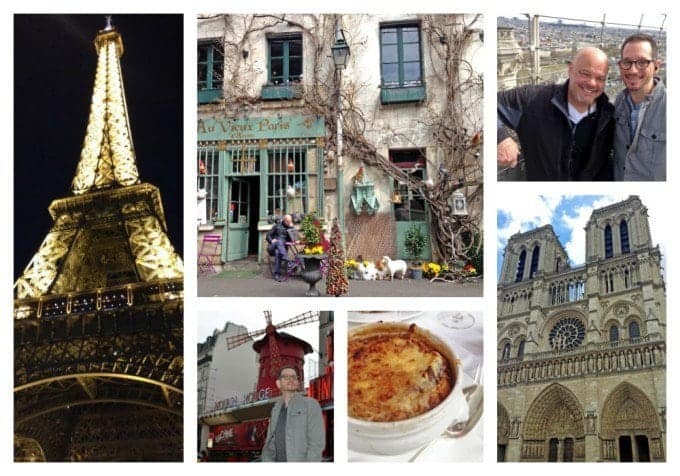 We end this post by sharing some of the highlights of our visit to Paris. If you’ve not been, I hope you get the chance to visit. It’s good to be back and we thank you for visiting Platter Talk. A versatile and delicious recipe, inspired by Cook's Illustrated, you won't believe these chicken wings came from your kitchen. Using paper towels, pat the chicken wings dry. Combine dry ingredients in small mixing bowl. Use fork to stir thoroughly. Note: Make sure you are using baking powder NOT baking soda. 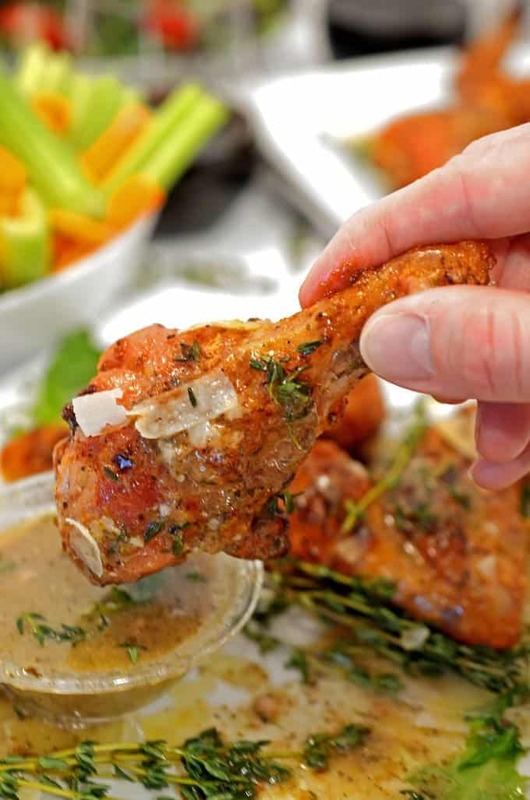 Place chicken wings in large mixing bowl and slowly sprinkle dry ingredients over the chicken wings while stirring with a large wooden spoon or rubber spatula. Be sure to cover as much of the chicken as possible, with the dry ingredients. Spray oven rack with non-stick coating. Place rack on bottom center position of oven. 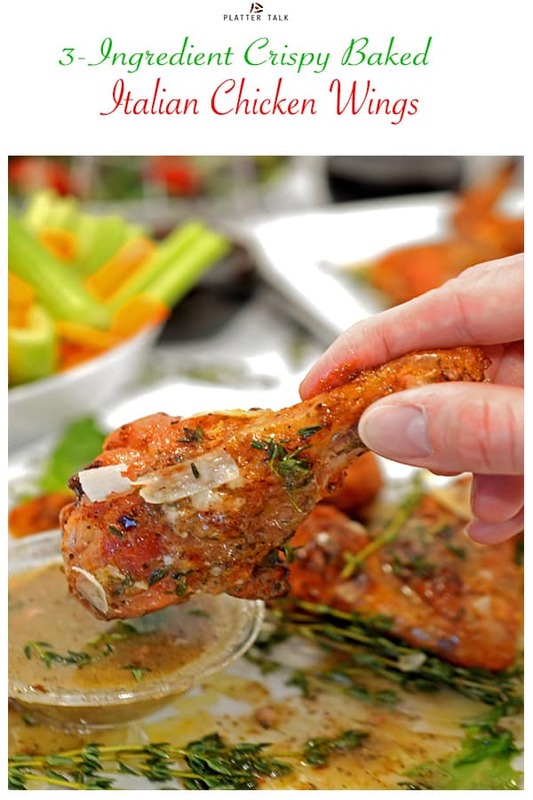 After 30 minutes, increase oven temperature to 425° F. Raise up rack of chicken wings to center level. Bake for 45-50 minutes at 425°, until wings are brown and crispy. Remove from oven and allow to rest for five minutes before serving or mixing with optional sauce. Be sure to use baking powder and baking soda. In lieu of using oven rack for the wings, you can use a cooking rack placed over a foil-lined baking sheet. If tips of the wings begin to turn black, cover them with a little piece of foil. Garnish with shaved Parmesan cheese, if desired. We enjoy wings…we grill them, however, this baked version sounds and looks great! Glad you had an awesome trip to Paris! Yes!!! 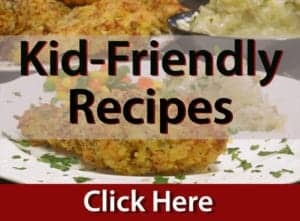 My mom always made chicken like this- same dressing and everything! This just totally brought me back to childhood! Perfection! Thanks, Angela. I can only imagine what an amazing cook you grew up with! Dan, this chicken dish looks yummy, but what really caught my eye was that YOU were in PARIS!!! I am thrilled for you! Did just a little of your French kick in? At the very least, I bet you were inspired!!! Madame D.
Madame D!!! How awesome to hear from one of my favorite Dames, ever! Yes, thanks to you, my French did kick in and I’ve had the opportunity to use it a few times since “the day”! I’m so honored to see your comment and know that you read Platter Talk. It’s been years, even decades since the days I sat in the senior choir, as a freshman, or did a little impromptu session in the practice room with you, Ron Johnson, and Kristine Mallette. Those were the days and I am a lucky guy to have been a part of them and for people like you who were my role models and teachers. Thanks so much for saying hello here, it is certain to be the highlight of my day. So simple – 3 ingredients. So much flavor and baked. Wonderful! These look and sounds amazing, I haven’t made wings in ages. I can’t wait to try them. I absolutely love chicken wings and you can never have too many flavor variations. These sound delicious!